The holiday season is upon us! 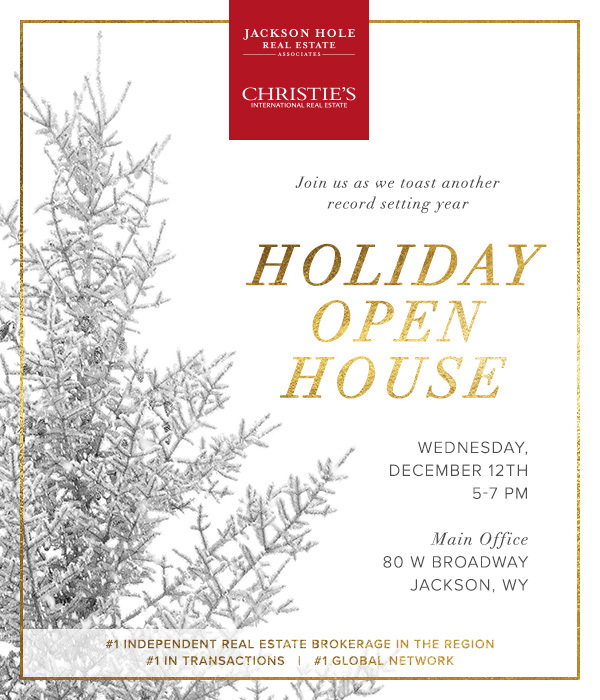 You are cordially invited to join Jackson Hole Real Estate Associates for our annual Holiday Open House, Wednesday, December 12, 5:00 – 7:00 pm at the Main Office, 80 W. Broadway. This time of year offers a moment to reflect. And at Jackson Hole Real Estate Associates, we have much to be grateful for. We are honored to be part of such an extraordinary community. For us, our success is defined largely by how we give back—and by every measure it has been a very successful year. From helping Old Bill’s achieve record fundraising, to sponsoring community events and organizations, to countless hours of community service, our team takes pride in helping to make Jackson Hole the most philanthropic place in the country. Please join us in raising a glass as we celebrate another successful year as the region’s leading real estate brokerage—and toast to a great year ahead.